"The Getaway" & "This Is the Way the World Ends" - 2 cliffhanger season finales. Which final scene of these episodes is your favorite? Vote below! 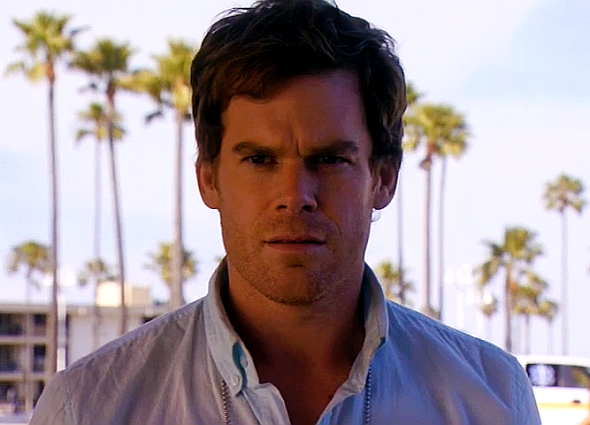 Although Season 4 was most amazing overall, I have to admit that the 6.12 finale had one of Dexter's greatest pre-kill speeches, and then the cliffhanger we've been waiting for since 1.12. Goosebumps at the very last second. Excellent. Yea that was my favorite as well. Not a huge fan of cliffhangers. Rita's death took me absolutely by surprise. Debra finding out about Dexter was hinted at since the start. I think Rita's death was a much better ending than the last season's ending. I'm pretty much repeating what Brooke said, but I never expected to see Rita being killed. Debra discovering Dexter's secret was inevitable. Both were good. If I had to choose my favorite final scene from any season, then I have to pick Rita and Dexter's wedding in season 3. We saw Dexter at a very positive place in his life and I thought that was nice. Nicholas. I knew Rita was in trouble when the blood dripped on her dress at the wedding. Besides that, did you notice in Dexter's monologue at his wedding that when he says "I finally found a partner for life..." the camera actually zooms in on Deb? At the time I thought that was very strange, but now I sorta get it. Ha!